OxySense 325i – This is our base model offers the ideal solution for conducting non-invasive or invasive measurements in oil, water or air. The instrument requires a computer interface and performs non-invasive headspace analysis for packages, bottles and blister packs; package material and design evaluation; closure design and evaluation; MAP production start up monitoring; research and development; QC and assurance, as well as product oxidation studies. It is particularly ideal for smaller labs, companies considering bringing their oxygen testing requirements in-house for the first time and companies looking for a low-cost solution. Simple one click oxygen measurements. Automatic data logging with real time graphical and log display. Optional Sample Tracker bar code software for managing multiple tests and samples. Integrated report writer with graph and log capability. New EasAlign Pen with integrated capture switch for easy measurement. 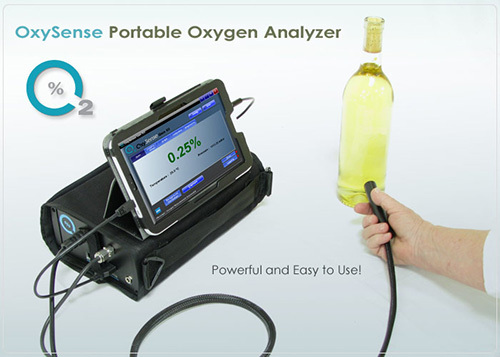 The OxySense 5250i – It is part of OxySense's innovative line of of non-invasive oxygen monitoring and permeation systems, is the oxygen measurement instrument of choice for labs and individuals who need to test or evaluate bottles, packages and other packaging materials through a variety of studies. The stand alone system can be used for non-invasive and invasive measurements in oil, water and air, and also perform permeability analysis (OTR) for film, bottles and “live” packages. This oxygen analyzer incorporates NEW features from a slant-top, touch screen display operation to expanded temperature measurement range and real time graphical and test log display.